Round Table: "Dream a Little Dream of Me"
1. What was your favorite Grey's Anatomy quote from the premiere? McCritic: Lexie's take on adultery: "It happens. People make mistakes. They ... sleep with the wrong person and ... they hide it but, if you ask me, it's the part that comes after that matters. The part where you make it right. And I think you're off to a good start." Sums up Grey's Anatomy perfectly, doesn't it? No show on TV examines the imperfect nature of humans in such a manner. Thanks so much for that, Shonda. missingBurke: My favorite was Owen's recurring, one-word quote: So? iheartizzie: When Alex demands to know what Izzie said to Meredith: "Did she tell you that I cried? Because that is a lie!" This is great because Izzie did not actually say this, and because being perceived as nice really does turn some guys off. 2. 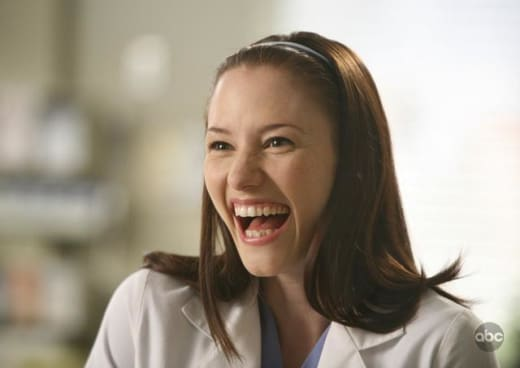 Lexie Grey: Cute or annoying? iheartizzie: I heart Lexie and think she and George would be great together (eventually, under the right circumstances) - unlike some of the other girls he's been with to date. McCritic: She's very cute. But incessant crushing on George by beautiful women - has he had time to breathe between Callie, Izzie and now Lexie - is annoying. Leave some for the rest of us! missingBurke: Lexie Grey does kind of irk me sometimes. I've found the character to be a bit inconsistent. I know it's not her fault but it just seems like Chyler Leigh is trying too hard. 3. Dr. Hunt's aggression: Turn on or Turn off? missingBurke: Oh, it is most definitely a turn-on. Which, oddly enough, makes the show even harder to turn off. Sorry. That was lame. McCritic: Let's just say that Cristina has far more willpower than I ever could. Yum. iheartizzie: I have to say, I was sketpical about Dr. Hunt at first, but rather than introducing a token Cristina Yang love interest we are supposed to accept just because, Grey's Anatomy hit it out of the park with this talented, tough Army doc. I hope he's not MIA for long. 4. Which Alex will show up next week? McCritic: Alex is evolving. But Darwin never said this process would happen overnight. We just need to sit back and enjoy the struggle Karev is undergoing as he learns that it's okay to open up. It really is, Alex. iheartizzie: He recoiled big time after Izzie described him so glowingly, and was last seen dragging some random girl into bed. Sensitive Alex is lurking beneath the surface and plotting a comeback, but look for vintage Season 1 Karev in the immediate future. missingBurke: He seems to be struggling to find out who he is. For that reason I think we will continue to see both sides of Alex intermittently. 5. Derek moving in will result in: A break up or a marriage? iheartizzie: There will be turmoil between now and then, but a marriage between these two is what we've all been waiting for from the very first episode. Sometimes it takes longer than we want, but Grey's Anatomy always delivers. missingBurke: Breakup. It may be a short-lived breakup, but you don't think they can really go a whole season of being together, do you? What would people talk about? McCritic: A marriage. Sorry, Meredith, but I need to believe in fairy tales. What's next for Derek and Meredith after he moves in with her this week?